The City of Saratoga already has many programs and services that serve older people in our community in collaboration with our many Faith Based Organizations, Senior Center programs and services, Parks and Recreation as well as City Services such as our Sheriff’s and Fire Departments. Our Senior center is the hub of all things senior in terms of the classes, programs, and senior support services. We have a cross jurisdictional close relationship with the County of Santa Clara including County Supervisors and County Commissioners. We have two County Commissioners who also serve on our Senior Center Board of Directors. 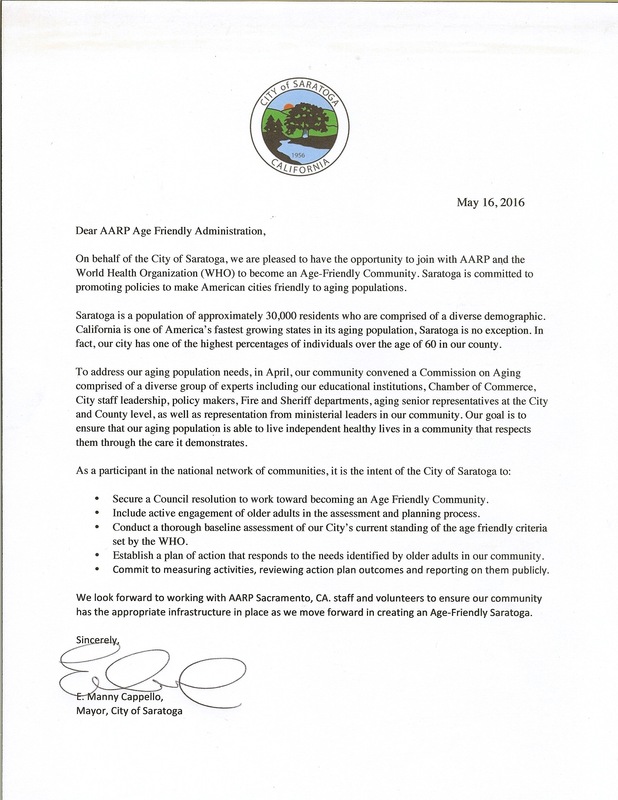 Our community plans to become more age-friendly by first assessing our city using the criteria set forth by the World Health Organization. From there our commission will review the results and prioritize areas for improvement. The commission will then submit an action plan to the City Council for approval prior to moving forward in becoming more age friendly.